In recent years as it has become easier and less costly for people to set up their own websites, more and more websites have been used for providing information about weddings. Because WordPress is free and simple for anyone to set up with most web hosts, it is naturally a popular choice for engaged couples wanting to provide information regarding their wedding. Wedding websites typically include many of the same features and content types, including bios of the couple, engagement photos, directions to the wedding and reception, hotel information, and sometimes the option to RSVP through the website. Sites are also used in some cases to showcase wedding photos after the big day to share them with attendees and those who were unable to attend. With WordPress, setting up a basic website to provide this type of information is pretty simple, and a number of themes have been developed specifically with weddings in mind. These themes often include some enhanced functionality, and they typically feature a design that fits well with wedding websites. In this post we’ll take a look at over 25 WordPress wedding themes that are great options for wedding websites. Most of them are premium themes that must be purchased, but there are some free themes included as well. Responsive – or mobile friendly can be a plus, especially if you know that many of your friends and family will access your site while out and about. However, this is not necessarily a must for a wedding site. Easy to Use – many couples setting up a website may have no to very little experience with web design, so a theme that comes with easy set up and customization is important. 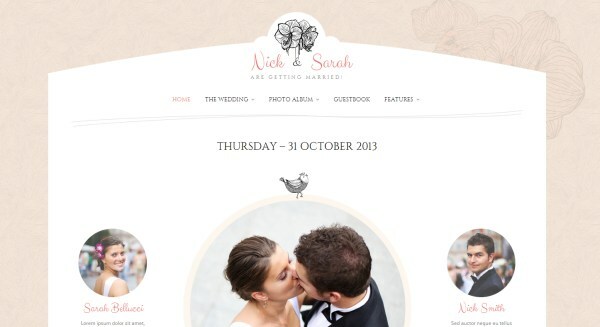 A beautiful design – you want your wedding site to make you look, well, beautiful! An image slider, a stunning background, and more can really help your website get guests excited about your big day. Customization options – you probably want your website to match your theme and colors of your wedding day, so the perfect theme is one that either already looks exactly as you need it to or that has color and background options. Social media support – a live feed, such as for Twitter or Flickr, or at least social media buttons so that friends and family can easily spread the word is a bonus. This gorgeous theme comes with lots of customization options so that you can go elegant and feminine or neutral and professional with your look. You can even change the navigation menu to have a scalloped design. Married is fully responsive and comes with lots of customization options. For instance, you get to choose from hundreds of Google fonts, edit the colors, choose a full width page layout, and much more. Plus, the image slider on the homepage looks stunning. It’s fully responsive and can sync with your wedding registries using the Bean Registry plugin. 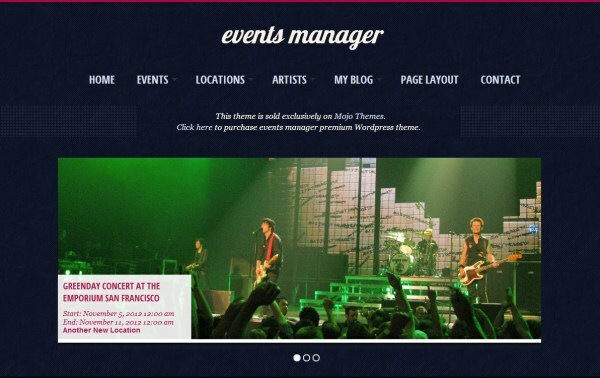 This responsive theme comes with an RSVP module and other incredible features. 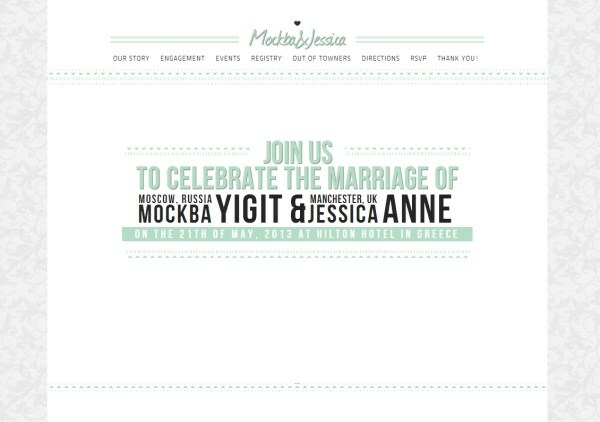 Just Married is very easy to install and customize for your wedding theme! 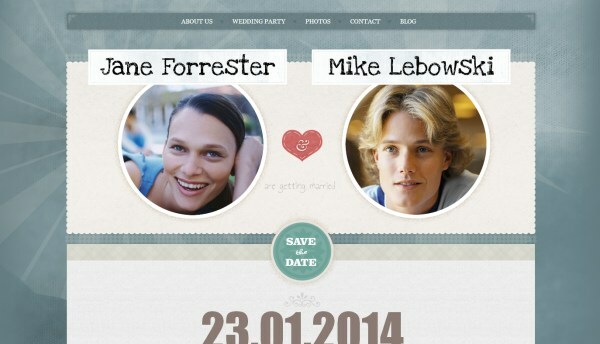 GeekLove is a responsive wedding theme with a clean design and layout. Plus, it comes with everything you need to help prepare guests for your day. For instance, this theme comes with an RSVP section, translation support, wedding events pages, a guestbook for well-wishers, and tons of easy customization options. 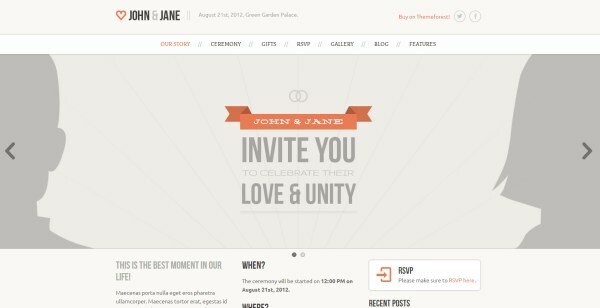 This vintage theme allows you to send invitation emails with RSVP functionality. Other excellent features include a 100% responsive design, filtered photo album gallery, custom background, countdown widget, lots of social media options, translation ready, and much more. A responsive theme with a stunning full size background photo option, Gittys makes your photos look incredible. Plus it’s 100% responsive and retina ready so that your images look beautiful on any device. A theme customizer and over 30 shortcodes make it easy for you to create the right look for you. 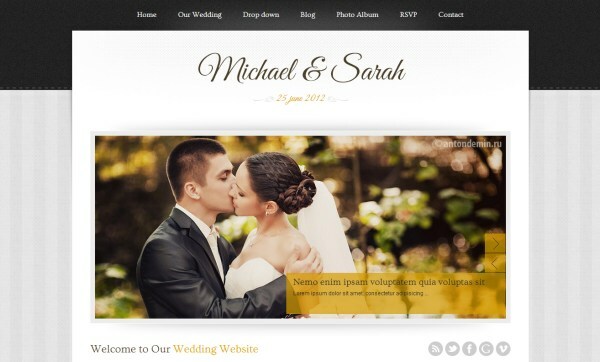 For wedding vendors, this theme also comes with WooCommerce for easy online retail. 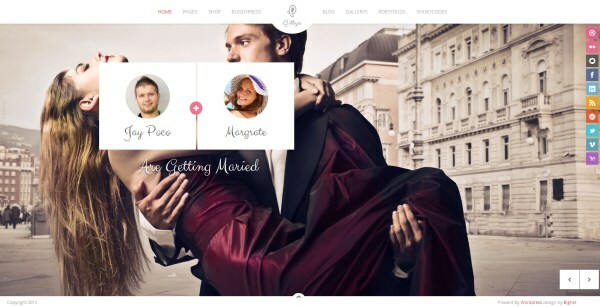 And BuddPress turns your wedding site into a social media portal. 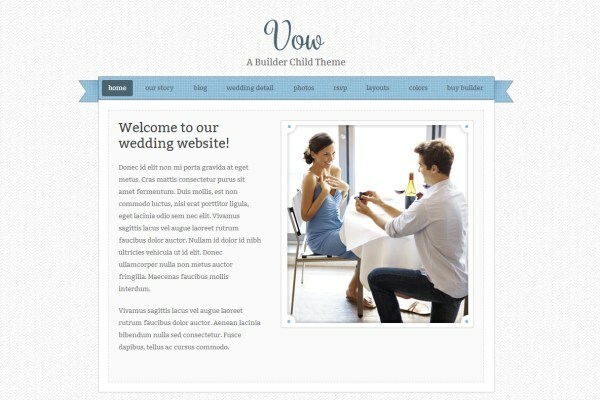 The Wedding Day is a responsive wedding theme with a drag-and-drop builder for quick customization. It also comes with a free print invitation! Other excellent features include a guestbook, countdown, and RSVP form. 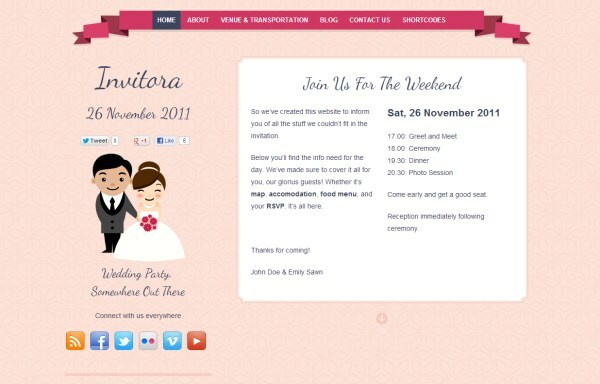 This theme works as a save-the-date or invitation website. Wedding Invite is a one page design that is simple to set up and use. Features include a groom’s panel, photo gallery panel, lots of graphic options, wedding settings panel, a fancy slider, map, and custom fonts. A responsive theme with a classic and elegant style, Wedding works for a wedding website, personal site, or even a portfolio. This theme includes a blog, gallery, portfolio, menu manager, automatic image resizing, multi-level dropdown menu, simple theme options, threaded comments, flex slider, and much more. A responsive wedding theme built on the Bootstrap framework, Wedding Vow runs smoothly and is easy to design with a drag and drop admin. Ultra high resolution graphics, a flex slider, over 360 icons and over 500 Google Fonts, 8 color styles, a full width gallery and more make this theme a gorgeous one for showing off your big day. 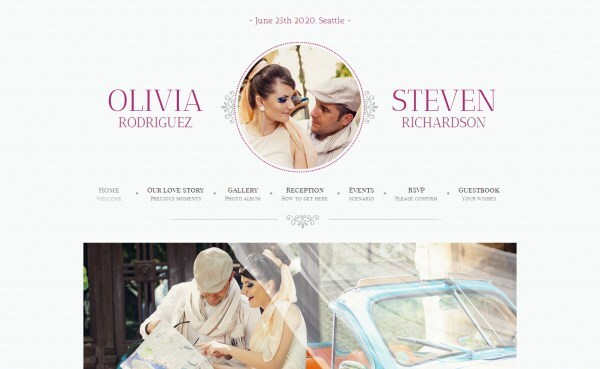 A single-page responsive theme, Wedding is responsive, retina-ready, and has a simple yet stunning single page design. Easy to customize, this theme comes with unlimited colors, a timeline feature, a gallery with multiple albums, over 250 icons, over 20 shortcodes, a unique slider generator, translation ready, and even post formats and featured images. Nunta Wedding is a responsive, retina-ready theme with unlimited skins, more than 600 fonts, and 10 different color schemes. It also comes with excellent support, a theme options panel, and is translated into 7 languages. 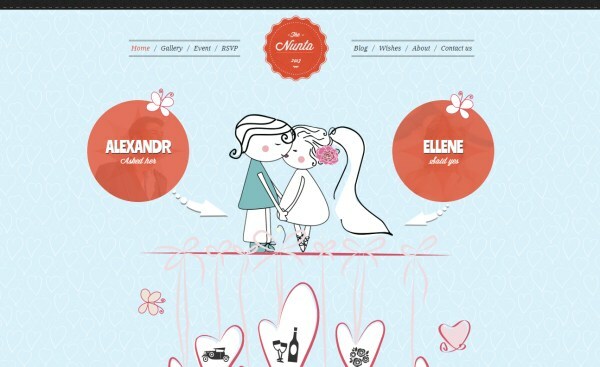 A responsive theme, Game Over comes with some really amazing features perfect for the ultimate wedding website. It comes with a love story and events timeline, guestbook, Facebook commenting, beautiful animation effects, and a photo album. Lots of features make creating the perfect site easy: unlimited custom templates, background colors and images, over 13 widgets, 100+ shortcodes, drag-and-drop layout builder, and more. 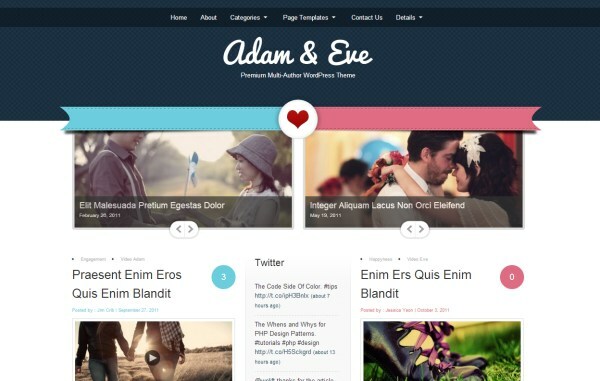 Adam & Eve is a responsive theme with a very unique layout. 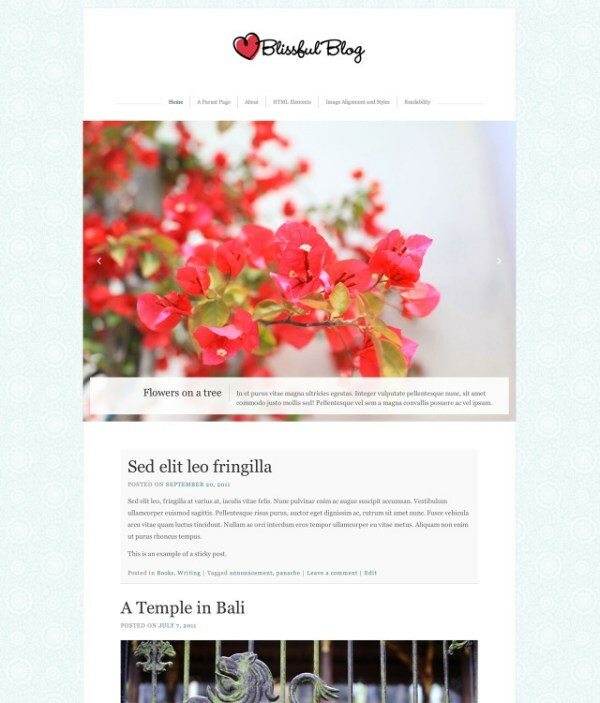 Based more on a wedding blog idea, this theme lays out images and content in a grid, magazine-like design. Write to your heart’s desire about in-laws, choosing photographers, how much you love your fiancee, and everything in between. It shows your latest posts in a featured posts slider and comes with a customizable sidebar. A theme for managing an event, like a wedding, Eventful makes organizing all of your events leading up to your wedding day quick and easy. This theme comes with a responsive design, a complex yet easy to use event manager, a powerful Ajax calendar, 2 front page slideshows, custom menus, Google maps integration, tons of shortcodes for making your site look pretty, and an excellent booking system. This wedding invitation theme is an excellent way to save money on printed invitations and provide even more information than could ever be included in a print version. 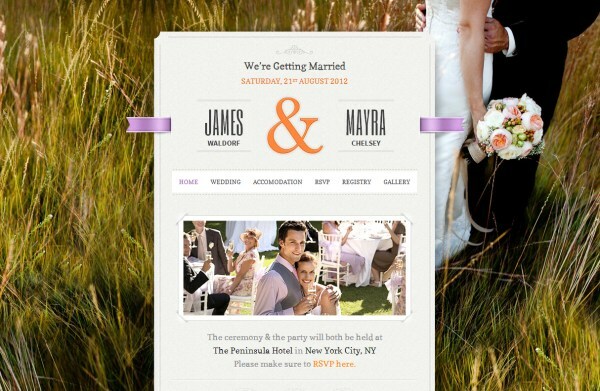 And it’s a responsive design so that guests can keep up with your wedding and events on the go. As a one-page design, this theme was created with usability in mind with navigation menus that stay in place while users scroll down the page. Also included in this single page layout are 6 color schemes, a photo gallery, social network integration, lots of widgets for easy customization, and 3 page templates. 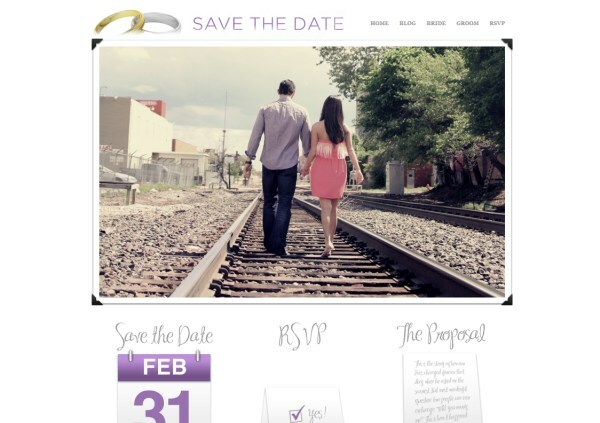 The Save the Date wedding theme allows you to create and publish a website fast. This theme comes with a Save the Date widget, RSVP form, a section to easily share registration information, and much more. 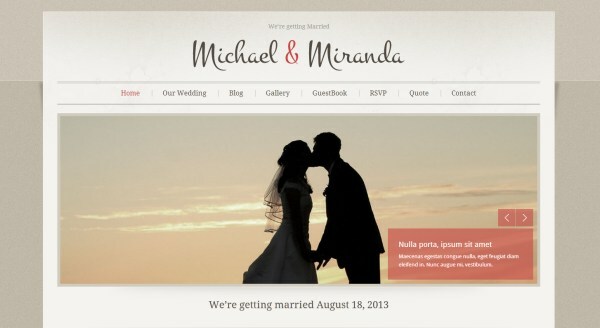 MJ is a unique theme that works for wedding invitations as well as a personal or business website. While not responsive, the theme still looks great on tablets and any laptop or desktop sized screen. This child theme from iThemes is available in four different color schemes. Plus, Vow comes with a pretty ribboned menu, and a bright and clean design. 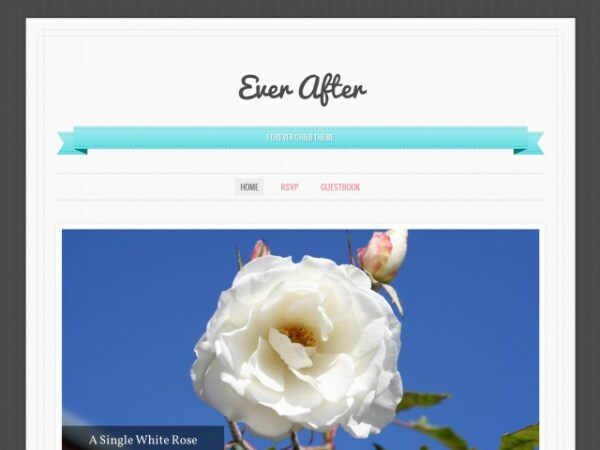 Ever After features a responsive design and many more features than most free themes. For instance, this theme comes with a one column design that makes displaying both photos and videos quite stunning, an RSVP form, a countdown widget, a guestbook, post formats, a responsive design, and so much more! Lovebirds is a quaint wedding theme but one that comes with lots of incredible features – it’s hard to believe this theme is free! This theme allows for location information, RSVP, bachelor/bachelorette party details, links to your registry, your story, a guestbook, and even customization options to change up aspects like the header. 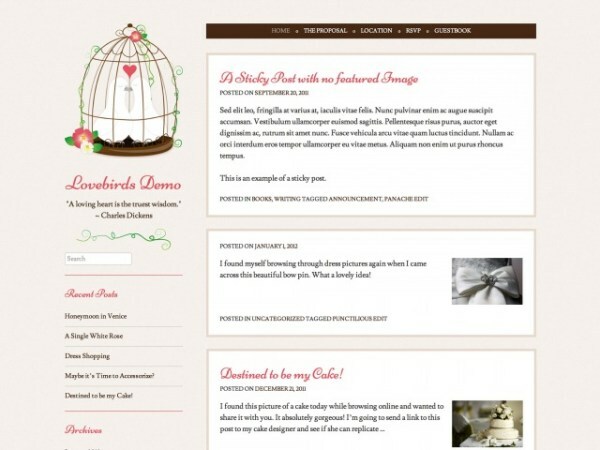 The Sugar & Spice theme is chic and elegant with multiple layout and color options to choose from. 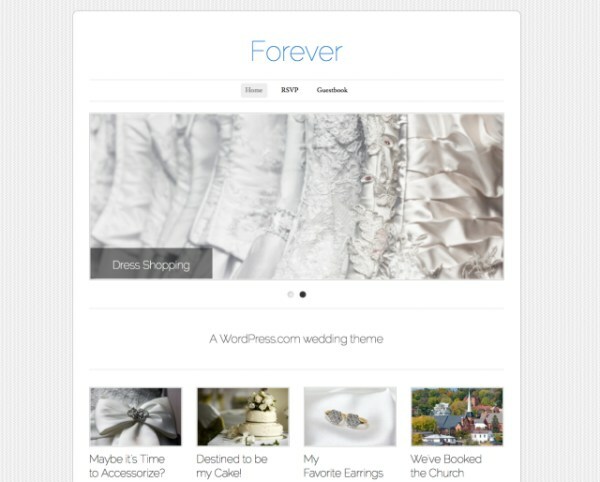 The Forever theme displays your wedding events, photos, and information in a very organized, easy to use layout. The homepage has quite the dramatic look with an optional featured posts slider and four latest posts in a neat grid layout. More features include the ability to customize the header, colors, and background. This amazingly free theme also comes with a countdown widget, a guestbook template, contact forms (great for RSVP), custom domain names, and much more. The Blissful Blog is a wedding theme that displays your photos and information in a beautiful layout with a full width featured content slider and a full width page layout. Plus, this WordPress theme is easy to customize with features such as a custom menu, custom header, and lots of widgets.